Virginia International Raceway (VIR) will host the eighth round of the Continental Tire SportsCar Challenge. The two-hour Biscuitville Grand Prix will take the MINIs through 17 turns on a 3.27 mile course. With only three events left for the season the competition will surely ramp up. 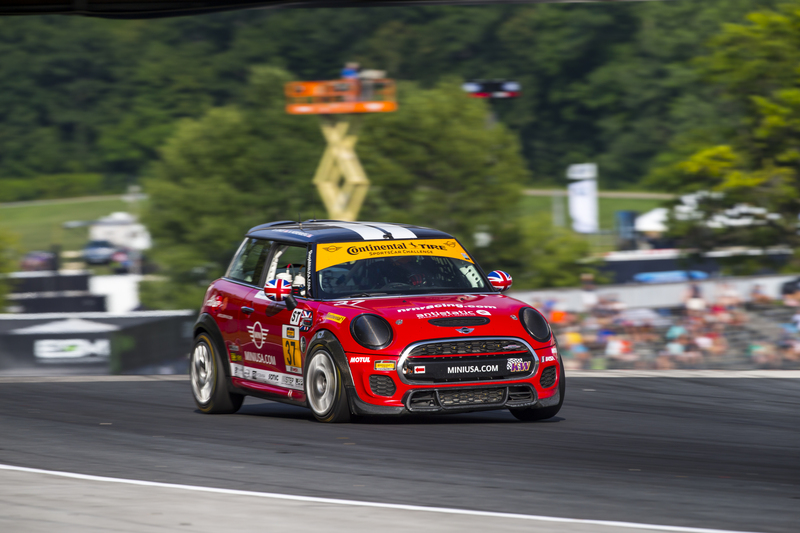 MINI maintains a three point lead in the manufacturers standings over BMW. The Pombo brothers and Mike LaMarra are still within striking distance of the drivers championship as well. With both titles still in reach, team owner Luis Perocarpi is looking forward to VIR. Practice and qualifying will take place on Friday, August 17th. Colin Mullan, driver of the 52 MINI has qualified on the front row for the past four events and will look to continue that performance in search of his first pole position. Derek Jones and Nate Norenberg will once again be in the 37 and are coming off of their second podium finish of the season at Road America. This was especially exciting for Norenberg since it was his home track. Norenberg and Jones will be looking to follow up that finish with another strong run at VIR. The Biscuitville Grand Prix will take place on Saturday, August 18th at 2:10 PM EST. You can watch the race live on IMSA.tv, or on the IMSA mobile app. Qualifying will be on IMSA radio and you can keep track of timing and scoring for all events at scoring.imsa.com.